Rome wasn't built in a day. In fact, it's taken over 2,500 years to get to what you see today, a genuine urban palimpsest. This private 3-hour guided tour takes you deep beneath the layers to reveal a fascinating history. With a guide at your side (choose to walk or take a comfortable minivan), visit the greatest hits of the city, including the Colosseum, the Pantheon, the Farnese Palace, the Trevi Fountain, the Spanish Steps and church of Santa Maria sopra Minerva, the city's only Gothic church. 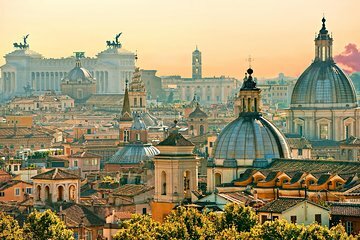 This 3-hour tour is a great way to get an overview of Rome and its history. Our guide, Alessandra Amorino, was energetic, funny and fun to be with, very organized, and super great on all the history, art, and splendor of Rome. We've taken private tours in Prague, Berlin, Barcelona, Santiago Chile, and Alessandra was far and away the best we've had. Highly recommended you ask for her.